Papaya is the most economically important species within the Caricaceae family and it is widely cultivated not only for fruit consumption, but also for the proteolytic enzyme papain, which has several commercial and medical uses. The Golden genotype of papaya (Carica papaya), named for its yellowish leaves, produces fruits very much appreciated by consumers worldwide. However, its growth and yield are considerably lower than those of other genotypes, such as ‘Sunrise Solo’, which has intensely green leaves. Previous work has shown that Golden had similar CO2 uptake rates to ‘Sunrise Solo’, which suggests that physiological processes other than photosynthesis are likely responsible for the reduced growth and yield of Golden. Net leaf carbon gain estimated from leaf photosynthesis alone typically leads to an overestimation of plant performance. Therefore, leaf respiration in the dark and in the light must also be considered to obtain an accurate C-balance estimate. Golden (A) and Sunrise Solo (B) plants. Image credit: J.S. 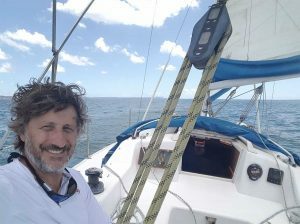 Paixão. A recent study by Paixão et al. published in AoBP provides the first complete picture of leaf carbon balance in two economically important genotypes of papaya and demonstrates that neither stomatal effects nor reduced photochemical and carboxylation capacities of the Golden genotype affected CO2 assimilation through photosynthesis. The authors consider that physiological processes other than photosynthesis/leaf respiration (LCB) can also contribute to reduced growth rates and yield of Golden. For example, photorespiration was observed to be increased in Sunrise Solo, which could improve rates of N assimilation into organic compounds, and thus contribute to greater biomass production in Sunrise Solo relative to Golden. Further experiments to evaluate the effects of N metabolism on Golden physiology and growth, as well as measurements of whole canopy gas exchange and phytohormonal balance are required to fully understand the observed responses as these all have the potential to affect both growth and yield. 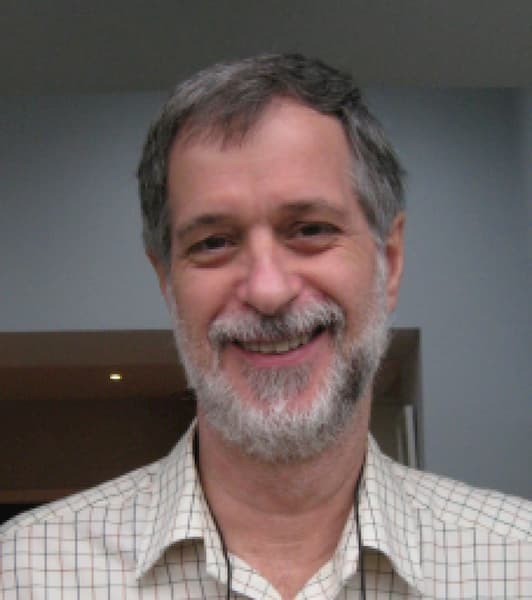 Dr. Eliemar Campostrini received his DSci (Crop Production) at Universidade Estadual do Norte Fluminense, Rio de Janeiro, Brasil in 1997 and has been an Associated Professor (Plant Physiology and Ecophysiology) at the UENF since 1999. He has been a visiting scientist at the Universita Cattolica del Sacro Cuore, in Piacenza, Italy and the University of Almeria, Spain. Dr. Eliemar and his colleagues have worked extensively on the environmental physiology of tropical and subtropical fruit crops, specially papaya, coffee and grapevine plants. The aims of his research are to provide deeper understanding of the effects of environmental factors on physiological processes (including gas-exchange, sap flow, photosynthetic pigments, chlorophyll fluorescence) of papaya, coffee and grapevine. 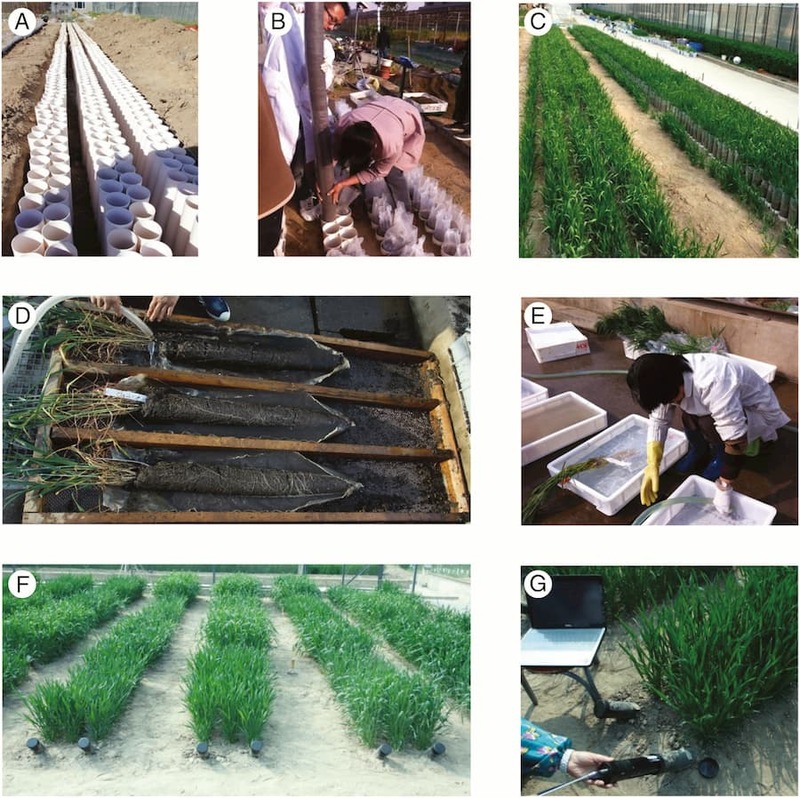 This research is crucial to minimize the deleterious impacts of suboptimal environmental conditions and to manage these crops for maximum productivity. Pollinator-mediated interactions between plant species may affect the composition of angiosperm communities. Floral colour signals should play a role in these interactions, but the role will arise from the visual perceptions and behavioural responses of multiple pollinators. Recent advances in the visual sciences can be used to inform our understanding of these perceptions and responses. Shrestha and colleagues outline the application of appropriate visual principles to the analysis of the annual cycle of floral colour structure in two Australian herbaceous communities. Examples of habitat and representative herbaceous species at the study sites. (A–C) Ground-layer vegetation with herbaceous species in flower, (D) Gompholobium huegelii, (E) Goodenia blackiana, (F) Burchardia umbellata, (G) Wahlenbergia gloriosa and (H) Glossodia major. The authors used spectrographic measurements of petal reflectance to determine the location of flowers in a model of hymenopteran colour vision. These representations of colour perception were then translated to a behaviourally relevant metric of colour differences using empirically calibrated colour discrimination functions for four hymenopteran species. They then analysed the pattern of colour similarity in terms of this metric in samples of co-flowering plants over the course of a year. The team used the same method to analyse the annual pattern of phylogenetic relatedness of co-flowering plants in order to compare colour structure and phylogenetic structure. They found that perceived floral colour structure varied with the sensory capabilities of the observer. The lack of colour structure at most sample dates, particularly the rarity of strong dispersion, suggests that plants do not use chromatic signals primarily to enable bees to discriminate between co-flowering species. It is more likely that colours make plants detectable in a complex landscape. Floral colour in angiosperms can be controlled by variations in the expression of the genes of the anthocyanin pathway. Floral colour shifts influence pollinator specificity. 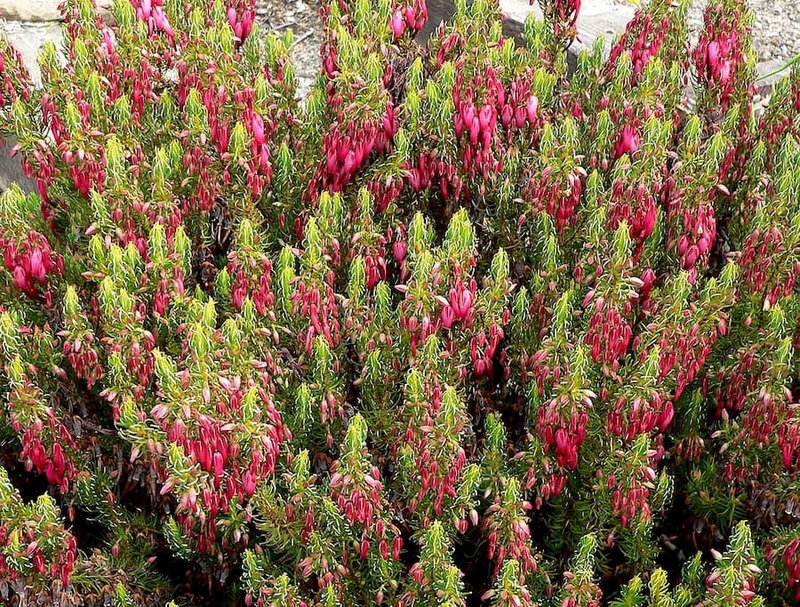 Multiple shifts in floral colour occurred in the diversification of the genus Erica (Ericaceae), from plesiomorphic pink to, for example, red or white flowers. Le Maitre et al. investigated variation in anthocyanin gene expression and its effects on floral colour in the red-, pink- and white-flowered Erica plukenetii species complex. Non-homologous mutations causing loss of expression of single genes were found, indicating that the cause was likely to be mutations in transcription factor binding sites upstream of the 5′-untranslated region of the genes, and this was confirmed by sequencing. Independent evolution and subsequent loss of expression of anthocyanin genes may have influenced diversification in the E. plukenetii species complex. The approach developed here should find more general application in studies on the role of floral colour shifts in diversification. Increasing energy demands and the necessity to reduce greenhouse gas emissions are key motivating factors driving the development of lignocellulosic crops as an alternative to non-renewable energy sources. The effects of global climate change will require a better understanding of the genetic basis of complex adaptive traits to breed more resilient bioenergy feedstocks, like willow (Salix spp.). 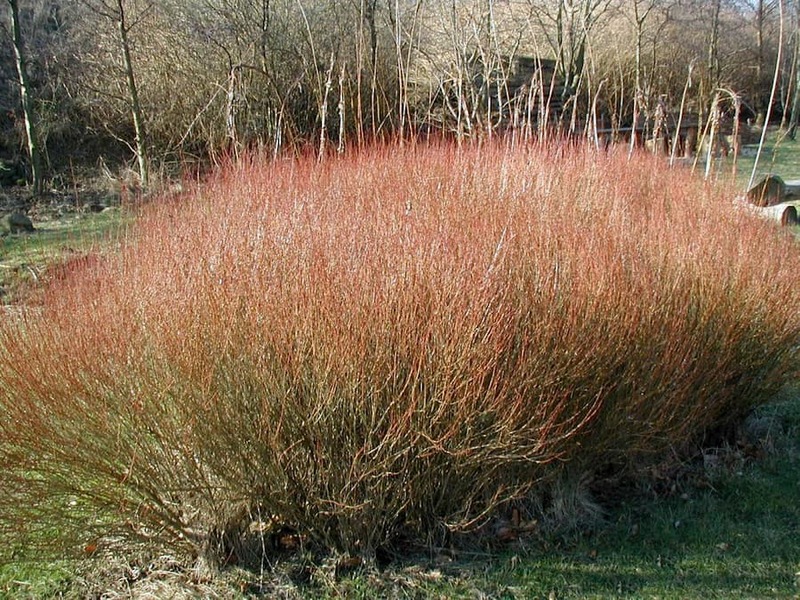 Shrub willow is a sustainable and dedicated bioenergy crop, bred to be fast-growing and high-yielding on marginal land without competing with food crops. In a rapidly changing climate, genomic advances will be vital for the sustained improvement of willow and other non-model bioenergy crops. Carlson et al. used joint genetic mapping to exploit genetic variation garnered from both recent and historical recombination events in S. purpurea. Individually, genome-wide association (GWAS) models differed in terms of power, but the combined approach, which corrects for yearly and environmental co-factors across datasets, improved the overall detection and resolution of associated loci. Although there were few significant GWAS hits located within support intervals of QTL for corresponding traits in the F2, many large-effect QTL were identified, as well as QTL hotspots. This study provides the first comparison of linkage analysis and linkage disequilibrium mapping approaches in Salix , and highlights the complementarity and limits of these two methods for elucidating the genetic architecture of complex bioenergy-related traits of a woody perennial breeding programme. This Cuttings collection is the last that will appear in the Annals of Botany journal. Since the column was launched on an unsuspecting world in January 2010 it’s been my unalloyed pleasure and joy to share with you my thoughts (admittedly, not always fully-formed or sensible…) on many topics with a loosely plant-based theme. If they’ve given any of you reading them a small fraction of the pleasure they’ve given me in researching and writing them, I can consider that a job well done. Along the way we’ve learnt some stuff, had a bit of a laugh, and generally realised that there is an awful lot of great plant science and plant-based stories all around us. I don’t know where I will be next month, but I hope to continue to educate, inform and entertain with tales from the botanical world somewhere, somehow, and that Plant Cuttings will rise again, like a phytological phoenix. I end by thanking Annals of Botany Chief Editor Pat Heslop-Harrison for allowing me the opportunity and privilege to create and curate this column and for his continued support of the Cuttings collections, and the team at Oxford University Press who’ve had the unenviable task of checking the hundreds of items, and the even more onerous one of ensuring that the thousands (? probably!) of URLs worked. Cheers! And farewell from Nigel Chaffey (aka Mr Plant Cuttings). We introduced ‘Plant Cuttings’ to Annals of Botany back in January 2010, as a round-up of notable plant-based items from the world’s media. With the inclusion of a news section in the Journal, we aimed to connect and build a community of botanists. We moved on to develop Botany One as the on-line news presence of Annals of Botany (originally as AoBBlog.com), and Plant Cuttings were also published on-line here, being important for developing the readership, informality and author-base for the blog. Now Botany One is independently edited from the journal, and is widely respected and read with its own community. Indeed, Botany One is ranked as the top botany website and blog for botanists and plant scientists, and the best blog for botany students. At this point, as your Editors do regularly, we have evaluated our Annals of Botany journal content, and have decided that Plant Cuttings should end after this issue, increasing our focus on our core aim of publishing the highest quality of rigorous, refereed science. We are so grateful to ‘Mr P. Cuttings’, personified as Dr Nigel Chaffey, for writing Plant Cuttings over nearly ten years, bringing together an eclectic range of plant-related topics with a characteristic humorous take that was all his own. I will miss reading them each month. Onwards! What is the most important part of a scientific paper? Arguably, it’s the Results section– although there are those who might propose that it’s the authors (scientists after all are humans and appreciate having their names associated with the science – especially if it is deemed to be first-rate and published in a high impact journal). But, there is one section that’s deemed to be of such unimportance that it’s not worthy of scrutiny during peer review and usually survives intact as the authors intended. And that section should never be overlooked in reading a paper because, although it’s not the most important, it can often be the most revealing in terms of the background or context to the work that’s detailed elsewhere in the article. 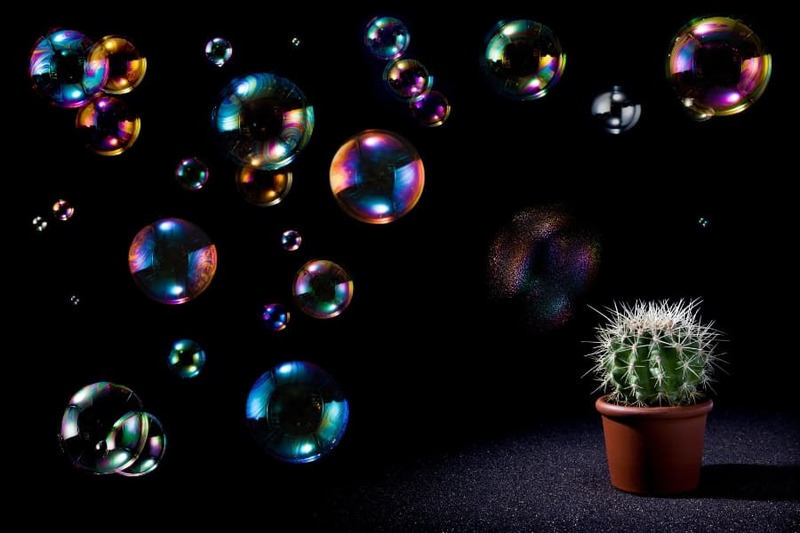 That section is the Acknowledgements, which comes into its own in papers such as that by Stephanie Crofts and Philip Anderson on cactus form-and-function. Investigating how “the influence of cactus spine surface structure on puncture performance and anchoring ability is tuned for ecology”, the enterprising duo examined the puncturing and anchoring ability of the spines of six species of cactus. Why? Well, according to the Introduction, cactus spines appear similar to porcupine quills, and, since the biomechanics of the latter as defensive mechanisms have been previously tested, but those of the former have not, they thought it was about time that the plant-like porcupines are subject to the same degree of scrutiny. Which all seems like sufficient justification to me. They duly carried out the necessary tests which included perforating chicken and pork products with cactus spines to test such important properties as the plant protuberances’ penetrative power, and difficulty in their removal (for a graphic image of this technique, see Jennifer Leman’s article). * A less painful piece of cactus-related research is provided by Chang Li et al. who report the “fog harvesting of a bioinspired nanocone-decorated 3D fiber [sic.] network”. Inspired and informed both by spider webs and cactus spines they’ve developed a structure that can effectively harvest water from fog (“tiny water droplets suspended in the air”). Although the specifics of this biomimetic solution may differ to that found in nature, the overall effect and mechanism is similar to water-abstraction by desert-dwelling plants in arid, but fog-frequented, places world-wide. An aspiration for the work is that it will be of benefit as part of an agricultural irrigation system in water-deficient countries, where fog-collection schemes** are being considered as ways of alleviating water-scarcity issues. For more on the moisture-harvesting abilities of plants – and animals (we must keep the zoosensitive readership happy), we recommend Malik et al.’s topical review. ** The ever-mischievous Mr Cuttings wonders if this was actually predicted last millennium, by ‘Tyneside’s favourite band’ Lindisfarne in their song ‘Fog on the Tyne’. Everybody interprets the last word to be the name of the mighty river Tyne in the north-east of England. Maybe we’ve been getting it wrong all these years. What if the ‘tyne’ referred to is in fact tine, the name for a prong of a fork? Which ‘pointy thing’ can be likened to a … cactus spine. However, and much like the issue with the quatrains of Nostradamus, it’s only after an event has come to pass that any ‘prediction’ can be understood. Which makes it little use as a prediction. Sorry, this is just ‘end-of-term’ foolishness from Mr C – the reason for which is provided by the next, final, plant cutting. Generally, higher land plants do not grow under submerged conditions and aquatic plants cannot grow in terrestrial conditions. On the other hand, amphibious plants are able to live under both terrestrial and submerged conditions. The amphibious species Hygrophila difformis develops serrated and dissected leaves when grown in terrestrial and submerged conditions, respectively. Furthermore, dissected leaves develop when H. difformis is treated with ethylene under terrestrial growth conditions. Although this morphological change is regulated by ethylene, it remains unknown whether ethylene induces the leaves to functionally deal with underwater conditions. Hygrophila difformis develops serrated and dissected leaves when grown in terrestrial and submerged conditions (top-left and bottom-right). These leaves are optimised to the conditions and underwater allow the leaves to utilise HCO3- in photosynthesis (top-right and bottom-left). Image credit: Horiguchi et al. A recent study by Horiguchi et al. published in AoBP reports on the plasticity of morphological and physiological responses to submergence in an amphibious plant Hygrophila difformis. 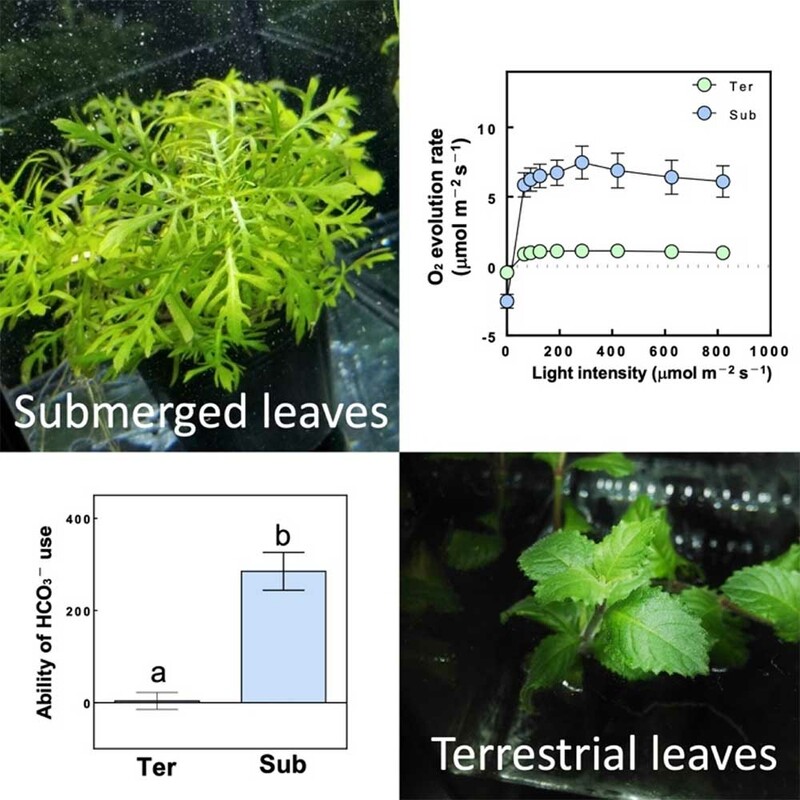 The authors analysed leaf morphology, measured underwater photosynthetic rates and HCO3− affinity in H. difformis to determine if there are differences in acclimation ability dependent on growth conditions: terrestrial, submerged, terrestrial treated with ethylene and submerged treated with an ethylene inhibitor. H. difformis was found to acclimate to a submerged environment by developing leaves with a characteristic morphology that are capable of photosynthesis optimised for the submerged environment by utilising HCO3−. Ethylene regulates the submergence response both by changing leaf morphology and inducing HCO3− utilisation. Processes requiring carbon concentrating mechanism (CCM) proteins such as HCO3− transporters and carbonic anhydrase are also involved in photosynthetic acclimation. H. difformis likely harbours genes and regulatory mechanisms that will prove to be valuable resources for discovering CCM genes in higher plants. Further characterization and understanding of this acclimation mechanism will provide novel resources for discovering CCM regulatory systems in higher plants. 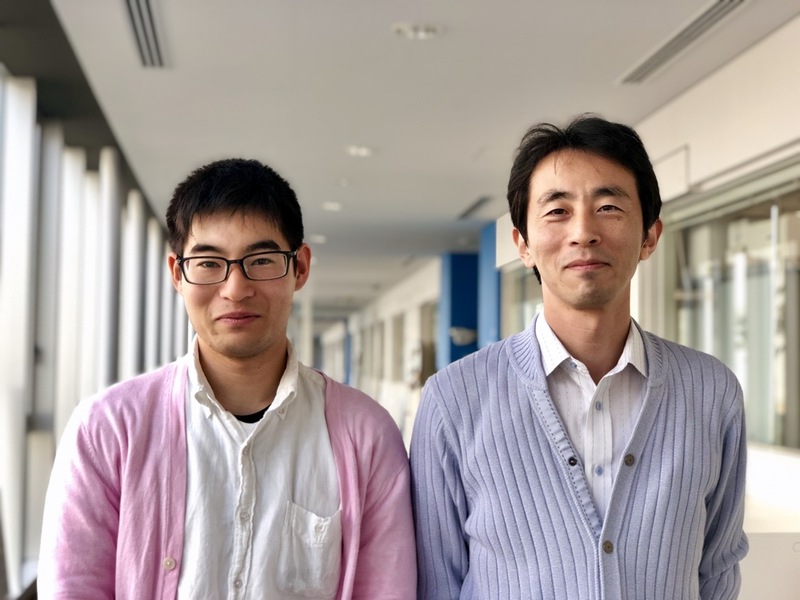 Genki Horiguchi (left in photo) graduated from Toyo Univeristy, Japan in 2019 (MSc Life Science), where he studied photosynthetic acclimation of amphibious plants under the supervision of Professor Naoki Hirotsu. Genki will continue this study in his PhD research where he will be more focused on the molecular mechanisms of underwater acclimation. Professor Naoki Hirotsu (right in photo) is based at Toyo University, Japan where his research aim is to understand the genetic and molecular mechanisms determining grain yield and quality of rice. He has also been interested in environmental responses of photosynthesis since completing his PhD. How do you attract pollinators, like bees and butterflies, if you have flowers? Almost 90% of flowering plants use bright colourful floral displays to attract their pollinators. The flowers of Guthriea capensis are different. G. capensis is the “Hidden Flower”. Just as their common name implies, the flowers are hidden at ground level, beneath the leaves of the plant. Also like the leaves, they are green. The flowers are, however, filled with nectar and strongly scented, which suggests that some animal does manage to find and pollinate the “Hidden Flowers”- but what is it? Researchers from South Africa and the Netherlands, based at the Pollination Ecology Research Lab at the University of KwaZulu-Natal and the Afromontane Research Unit at the University of the Free State, think they have the answer. They have published their discovery in the journal Ecology. The team found staked out a group of “Hidden Flowers” in the Maloti-Drakensberg World Heritage Site in South Africa. After many fruitless hours of human observations, cameras triggered by motion-detectors finally revealed the identity of a shy and highly surprising pollinator. Drakensberg Crag Lizards pick up pollen on their snouts when they visit the flowers to lap nectar. Lizards are not on the list of suspects, when botanists search for pollinators. Ruth Cozien explained: “Although it has been known for more than fifty years that some lizards do feed on flowers, they are still rarely considered as potential pollinators. Firstly, because they really are unlikely to be visiting flowers, and secondly because they are unlikely to be observed if they do visit! Lizards (like mice and shrews) may even actively avoid humans, so these interactions are really difficult to document. That the lizards have been found now, is down to affordable motion-sensitive cameras. But using them still isn’t a simple task. Ruth Cozien said: “The first challenge with filming “hidden flowers” is pointing a camera at any flower at all. The flowers lie on the ground, and the line of sight is almost inevitably obscured by the leaves under which the flowers are hidden. To get an angle where flowers were visible, we had to position cameras below the plants. One way was to either by angle them upwards on very steep ground. This involved a lot of re-positioning of rocks at 2700m! Another way was by partly sinking the cameras into the ground. “In theory that works to get the flowers in view. But you can’t be sure because both tricks make the viewfinder impossible to reach as it’s on the underside of the camera. Worse, you may obscure the motion sensor, which is critical to operate the camera! Once the team saw the lizards carrying off pollen, they made sure that the lizards really were pollinators. When lizards were experimentally excluded from plants, the number of seeds produced dropped dramatically, by almost 95% percent. Although flower visitation by lizards is not unknown, it occurs almost exclusively on oceanic islands, and the critical role of lizards for reproduction in G. capensis is virtually unprecedented. Just how lizards find the “Hidden Flowers” is the next riddle to be solved. Most lizards are insectivorous. In the harsh environments of islands, deserts, and high mountains, they may develop a sweet tooth and supplement their insect diets with sips of nectar. Lizards can locate food using only odour, and chemical analysis of the scent produced by the “Hidden Flowers” identified compounds which are almost unique in the plant kingdom. It seems likely that these extraordinary scent chemicals are key to attracting the lizard pollinators. Intriguingly, at close range, small orange glands are visible at the base of the inside of the flowers, and these glands bear a striking resemblance to the orange colour that male lizards develop in mating season to attract females. This similarity suggests that flowers may be using a colour that the reptiles recognise to enable them to locate the nectar. 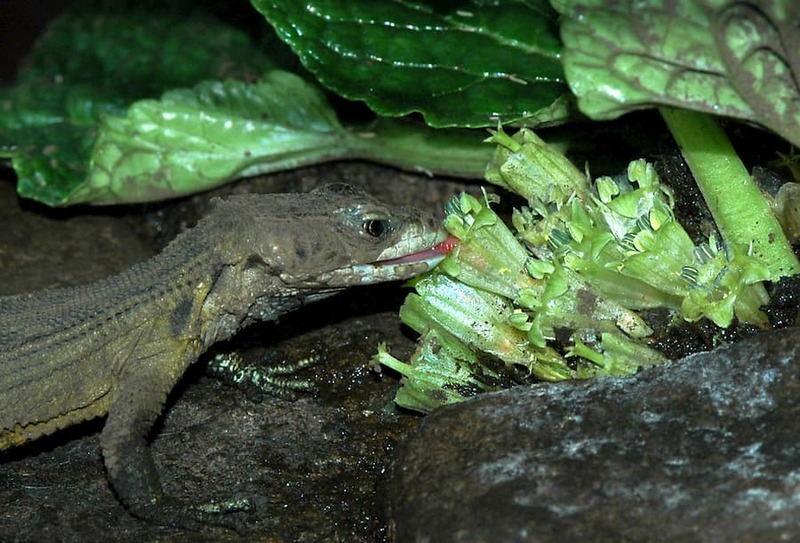 The unique combination of specialized lizard pollination in a continental setting provides exceptional opportunities for gaining insight into both the ecology of lizards and the function of unusual flower features. This study shows while insects such as honey bees are for pollination, there are still many unknown and surprising interactions that also need to be conserved. If we want to ensure that plants like the mysterious “Hidden Flower” persist then we will need to make sure that visits continue from the little dragons with a sweet tooth. How much wheat do we need? One prediction is we need production to double between 2005 and 2050. This challenge is more difficult due to abiotic stress with climate change. Long Li and colleagues have been examining root system morphology. Root system morphology is important for sustainable agriculture, but the genetic basis of root traits and their relationship to shoot traits remain to be understood. The aim of this study was to dissect the genetic basis of root traits at late growth stages and its implications on shoot traits in wheat. Root trait phenotyping. (A) PVC pipes were buried in a soil pit. (B) Soil-filled bags were inserted into each tube. (C) Plants at the jointing stage. (D) Roots were preliminarily washed with a sieve. (E) Roots were further washed in plastic boxes. (F) Minirhizotron pipes were buried in soil with a 45° angle of inclination to measure root traits in each trial plot. (G) Minirhizotron images were collected by a CI-600 Roots Monitoring System. Image: Long Li et al. 2019. Deep-rooted accessions had lower canopy temperature (CT) and higher grain yield per plant (YPP) than those with shallow roots. But no significant relationship was identified between root dry weight and shoot traits. Ninety-three significantly associated loci (SALs) were detected by the mixed linear model, among which three were hub SALs (Co-6A, Co-6B and Co-6D) associated with root depth at both booting and mid-grain fill stages, as well as CT and YPP. Minirhizotron system scanning results suggested that the causal genes in the three SALs may regulate root elongation in the field. The heritable independence between root depth and PH was demonstrated by linkage disequilibrium analysis. The YPP was significantly higher in genotypes which combined favourable marker alleles (FMAs) for root depth and PH, suggesting that a deep root and shorter plant height are suitable traits for pyramiding target alleles by molecular marker-assisted breeding. These results uncovered promising genomic regions for functional gene discovery of root traits in the late growth period, enhanced understanding of correlation between root and shoot traits, and will facilitate intensive study on root morphology and breeding through molecular design. The special issue will include observational, experimental and theoretical studies illustrating the process of population differentiation in plants. The goal of this special issue is to bring together observational, experimental and theoretical studies illustrating the process of population differentiation in plants and its underlying causes, but always considering ecology and genetics as two sides of the same coin. Submitted manuscripts can be more ecological than genetic or vice-versa. 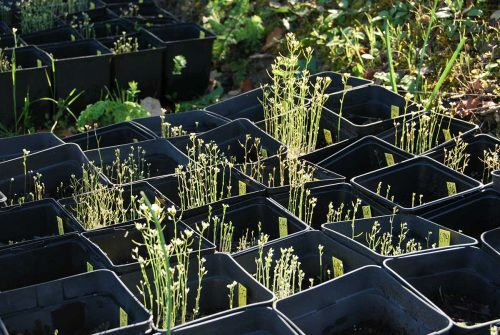 In this special issue, we expect to deal with a wide array of ecological and genetic factors accounting for population differentiation in plants, such as adaptive variation, phenotypic plasticity or physiological constraints, but also genetic drift, gene flow, migration, hybridization, epigenetic factors or polyploidy. Studies can focus on within- and/or among-population differentiation. There is no bias with regard to plant taxon (including ferns and algae), biome or biogeographical area. Contributions are expected to be hypothesis-driven, to develop their theoretical frameworks in depth and to evaluate the future research directions to be taken to advance their fields. The role of local adaptation in population differentiation from Jill T. Anderson, Department of Genetics, University of Georgia. Epigenetics and population differentiation from Conchita Alonso and Carlos M. Herrera, Department of Evolutionary Ecology, Estación Biológica de Doñana, EBD-CSIC, Spain. An experimental approach to quantifying trait differentiation from Tom E. Juenger, Department of Integrative Biology, University of Texas at Austin. We are accepting submissions from now until October 1st 2019 so please spread the word and submit your work. Find out more information here. Remember, AoBP are a non-profit, sound science, open access journal. We aim to provide an outlet for plant-focused research without the biases that affect much of scientific publishing. Thus, we base decisions to accept or reject papers solely on rigor, clarity and substance, and we use double-blind peer review, concealing the identities of authors and reviewers during the review process. We prefer to leave judgments about the wider importance of papers to the scientific community. AoBP is committed to simple and rapid processing of manuscripts and online publication of accepted works. Authors can submit their work as a single-PDF with few formatting requirements. We strive to provide initial decisions within 30–40 days of submission and our publication charge of $1350 per article is one of the lowest levied by any open-access journal in the biological sciences.